I have been making movies! Last fall I was in the USA and filmed one with Taproot Video founders Marilyn and Rainer Romatka. We had done some trial filming earlier in July but I won’t let anyone see that! I think that probably everyone’s first time in front of a camera is bound to be awful. Of course, you can’t be sitting there grinning the whole time but you don’t want to look like you are suffering with nerves either! I learned a lot with that trial experience and got back in front of the camera feeling much more comfortable last fall. In fact, it was a whole lot of fun. Putting the finishing touches on the set and lighting the night before filming. When I returned to Bolivia, I was feeling so good about filming that I got together and made a short film with a local videographer. I loved being able to use local Guaraní textiles to decorate the room in which we worked. We hung them on the wall and used them on the table. It gives the movie a nice ”lowland Bolivia” flavor. My best friend was there to help out, documenting the takes, handing me props etc. One of his other tasks was being ”chief mosquito-swatter”…yep that’s lowland Bolivia for you. Without professional studio lighting, it wasn’t the slickest set-up, but I feel that natural light has its own beauty. We had a good time and I am really pleased with the result. Here’s a shot captured from the movie to show those lovely Guarani hangings. They are woven in cotton with the pebble weave structure. The Guarani weavers only weave star and snake patterns when they use this structure as opposed to their weavings in the Moisy, or intermesh, technique in which they depict trees, flowers, birds, insects, people and plants in all shapes and forms. The title of the movie we made in Bolivia. I have made lots of little instructional videos and placed them on this blog but they have often been ridiculously short and shot in my bedroom in less than ideal conditions. Back in the days when I was using Flickr to host my videos, they had to be limited to just 90 seconds which meant really having to work fast! or splitting tutorials into several segments. Later, when I started using WordPress as the host, I still couldn’t enjoy making long videos because my internet connection simply couldn’t handle uploading large files. I would often leave them uploading all night only to be disappointed to find in the morning that everything had crashed at some point. 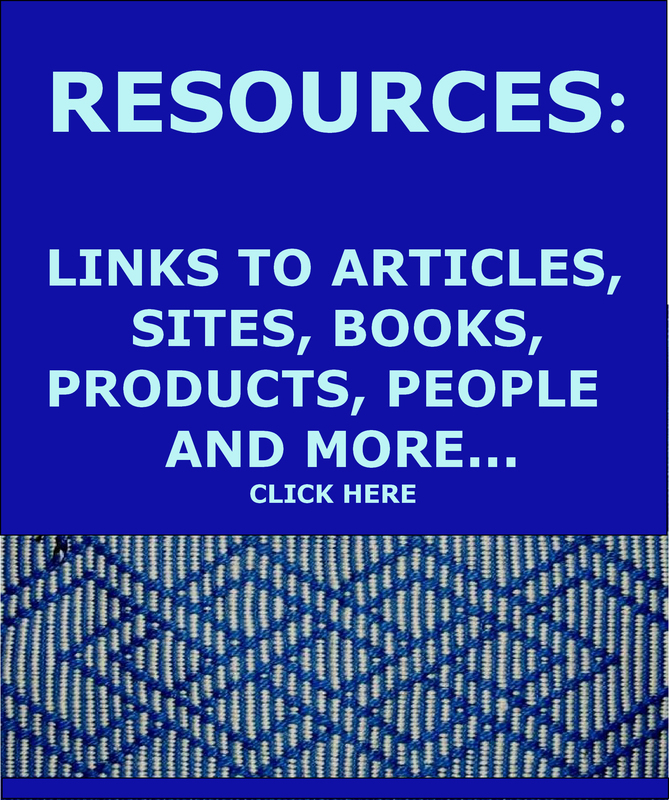 Fortunately, Syne Mitchell uploaded the heavy videos that appear in the WeaveZine article. So, I am pleased that this video I made in Bolivia is a luxurious 30 minutes long and has allowed to me include a lot of detail. I have a friend who has a slower but more stable internet connection than I do which made uploading much easier. 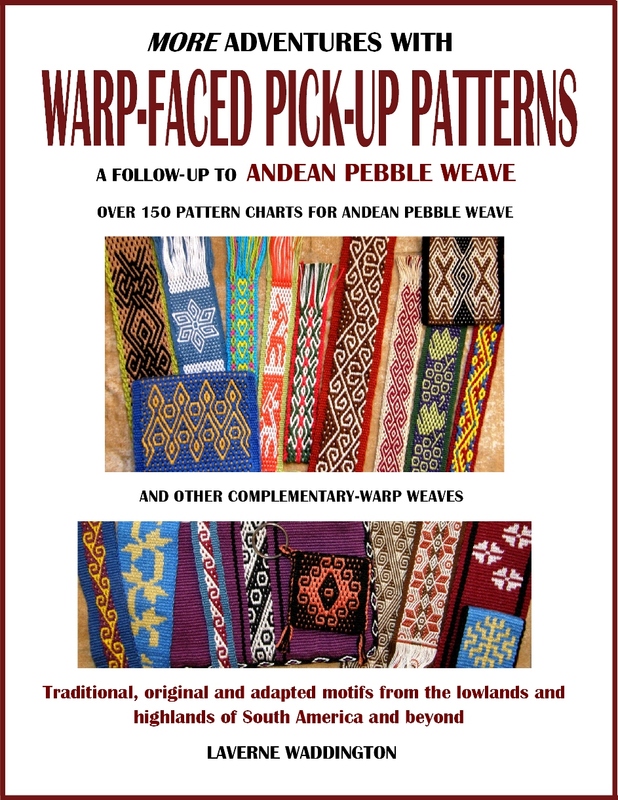 In the movie I show two basic and very useful warping methods, one of which is the one that I use for Andean Pebble Weave and other kinds of complementary-warp pick-up structures. I show this technique in my first book as an optional advanced warping technique in the Appendix because, as you can imagine, it is quite difficult to portray something like this in just images and text. As for the movie we made last fall… it’s is called Operating a Backstrap Loom and is the perfect follow-up to the warping movie. You can stream it or buy the dvd. I made it to address the questions that I am frequently asked online when people are taking their first steps in backstrap weaving…little doubts about uneven heddle length, fluff and fuzz collecting on heddles, sticky sheds, wonky edges, sheds that won’t open, fixing heddle errors, sticks and techniques for wider warps etc…And, I wanted everyone to have one resource that contained all these answers. I show some things that I have never covered on this blog and, best of all, you get to see it all in action. I am so excited to be able to show you all how to use your bodies to operate the loom so you can all be the loom…much more than someone sitting at a piece of equipment. One of my students told me that when she learned how to use her body to operate the loom she suddenly felt like she had become the ”shed whisperer”. I love that expression! Let’s all be shed whisperers! Of course, you are all still welcome to write to me any time you like with questions or just to say hi. You know where to find me! In fact, I insist. Show me what you are weaving and tell me how it is going, please! (For all of you who have ever rolled your eyes and sighed when I have told you to ”just keep practicing” when you have written to me about uneven heddle length, I have a great tip for you in this movie!.. something that needs to be seen in action :-)). I had this really great experience last year. Mary posted online about having some problems getting set-up for backstrap weaving. The heddles just weren’t working for her. She posted pictures but it was still really hard to see what exactly was going on. I did my best to help, sending her messages with explanations, links to tutorials and diagrams. I wanted so badly to be able to jump through the computer screen and sit beside her and help. I knew that I could have her up and happily weaving in moments. I found out that she lived in San Jose and suggested we get together as I was going to be there in my travels. A little voice inside was saying…San Jose is a big city! What are the chances of being able to get this together in the brief time you are there? You don’t drive, maybe she works, she probably lives a long way from your friend, imagine the traffic etc etc. It turned out that she lived within four blocks of the friend with whom I was staying. It was meant to be! I spent some time with her and we sorted out the heddle problem…..
…and then she wove! I was able to show her how to use her body movements to operate the loom and give her some tips for creating even selvedges. There’s Mary, the shed whisperer. You have no idea how much I would love to be able to do that with everyone who writes to me with questions. Making this movie is my attempt to sit right next to all of you who need a little guidance. Of course, many people take my written answers, solve their problem and move on to happy weaving while many just slip comfortably into it and have no questions at all. I have been lucky to have been able to meet many of you who have supported me and my blog over these years in my travels. It’s always wonderful to see what you have been quietly creating at home on your backstrap looms. The movie is available for streaming or as a dvd from Taproot Video. You can watch a short preview here. As for Taproot Video…working with founders Marilyn and Rainer Romatka was a wonderful experience. Rainer, who was behind the camera, has a keen eye for detail and came up with so many interesting ideas and suggestions. Marilyn is the most resourceful person I have ever met. I started calling her ”MacGyver Marilyn”. She wore many hats… in charge of audio, clap board, continuity, set re-arrangement etc. She and Rainer are an amazing team. She also managed to take these pictures during the filming and her suggestions during editing were invaluable. Marilyn has her own set of folkart classes on the site including the extremely popular Bow Loom Weaving class that she taught at BRAIDS last year. Kris Leet has classes on tablet weaving techniques and Linda Hendrickson teaches ply-split braiding techniques. Joan Ruane has two movies on cotton spinning. She was my roommate at the Mannings a few years ago and it is nice to be sharing space with her in the new Taproot Video community. In the meantime, between some fun writing projects, I have been at my loom very slowly moving along with my silk weaving. It is funny how this slower-than-usual pace with the more complicated three-color pick-up can soon start to feel ”normal”. I might be 1/6 of the way along now. 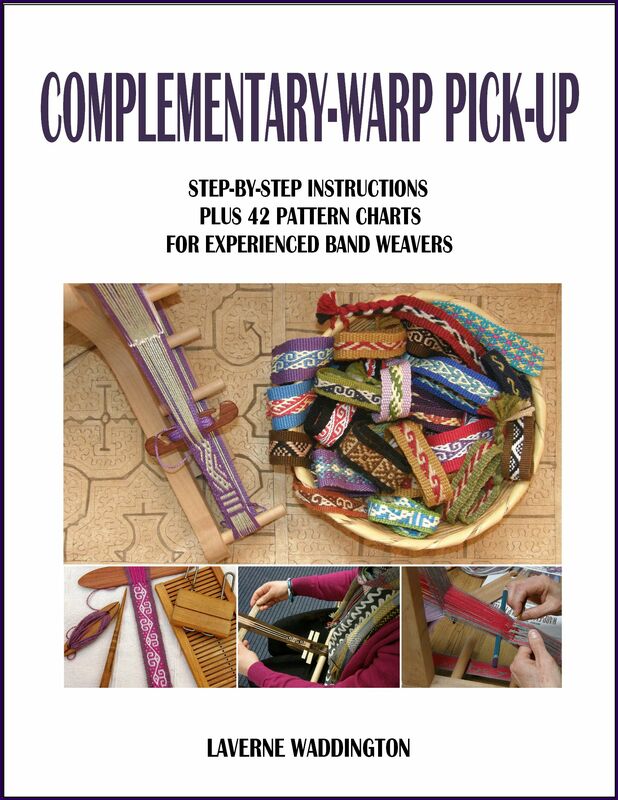 I do hope you enjoy my free warping video and hope that you will consider following it up with Operating a Backstrap Loom. Thank you so much for all your support. I am really excited about and pleased with these movie projects. It’s been a long time since I released my last book and it feels good to have something new out there I am happy to have jumped over the nervous hump of filming! There will surely be more movies to come (and books). On the set of Basic Warping for Backstrap Looms. Fantastic, Laverne! I posted this to the Foothill Fibers Guild page for everyone. Thank you so much, Cheryl. Sending you big hugs. Laverne, the video is amazing. There are some things I was doing right and lots I was doing wrong. Your Operating a Backstrap Loom video is helping me to be better. Being able to see the way it should work is such an immense help. The warping video answered questions I didn’t even know I had. Thank you. Thank you this and everything you do for backstrap weaving. So happy that it has already been so helpful. Thanks, Michael. Congratulations, Laverne!!! I will definitely be ordering your Taproot cd! felicitaciones por vuestro esfuerzo y por sus bellas obras. WOWIE ZOWIE! What an awesome video on warping for backstrap weaving Laverne! I felt like you were right there on the patio once again. I love the “…over my shoulder” moments. You are up-beat, smoothly explaining your motions and those cute little pots to hold your string are beautiful! You and your crew did a wonderful job! BRAVO!!! Thanks, Ginny. It beats being one of eight trying to get that over-the-shoulder view, right? Thank you for your comments. Those pots were painted for me by a friend from Colombia. ¡Excelente! te ves muy relajada y natural . Debes ser una espléndida maestra. Lo más notable son tus manos que parece que también hablaran. Gracias! Si, me gusta tambien hablar con mis manos! Thanks for being an awesome blogger. You never fail to amaze. Congratulations and thanks for continuing to be a geat teacher! Have ordered the video. Do you have a new book in the works as well? Thank you Jim! Yes, there are books in the works. I know I have been saying this for a long time but things just keep evolving. 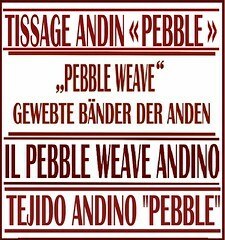 Right now, I have finishing the layout of the Spanish translation of Andean Pebble Weave as my top book priority….almost there and then I can continue with the other books in English. Your DVD arrived in the mail yesterday. And you did it — jumped right through the computer and showed me new things and reinforced things you showed me in person back in Sydney! Thanks again, Laverne. Awesome, Laverne! 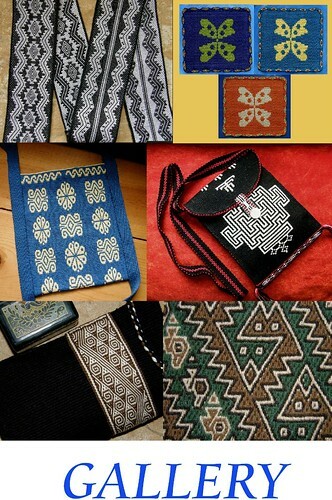 You are so inspirational and the movies help to make it possible for us to join in on the fun of blackstrap weaving. Thank you! Always grateful for your kind comments, Connie. very cool video, I like the way you play with the audience-camera and say “come look over my shoulder”. still a lot to learn, hope there will be more videos. Congratulations! Although I haven’t been able to attend any of your workshops for a few years, I enjoy the blog with its ideas and inspiration. I ordered your new video on Monday, arrived Thursday, and watched that night. Both videos are just what I need as refreshers to get back into my backstrap weaving projects. Great job! Looking forward to seeing what’s next! Thanks, Karen! As you know from my blog posts, I was with Dorinda in the highlands recently. I am so glad you two were able to meet and do some cool stuff to promote the Bolivian weavers in the USA. I just got the DVD, Laverne. It’s fantastic! I hope you’ll make more in the future, teaching the different weave structures that you use to make your gorgeous textiles. Thank you! Thank you so much! It’s new territory for me but I do hope to make more movies. It has been a lot of fun. Hi Laverne. I want to thank you so much for the warping video. The second warp method was so clear to me – finally (after a few failed attempts from other books, etc)! hi.how are you.i am from iran.i see your handwork .that are so beautiful.i weaving card or tablet but i like to weaving backstrape.thanks for your art.excuse me my english is not good.